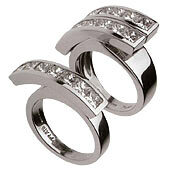 Finger Food: The diamonds in Garrard's "swing" rings seesaw on a hinge. Jade Jagger, Creative director of London jeweler Garrard (and, yes, daughter of Mick), wanted the company’s first New York store to be an elegant but avant-garde space where she could entertain when she’s in town. After seeing this Elle Décor–worthy loft on the third floor of a nondescript Soho building (133 Spring Street; 212-688-2209), I can imagine that Jagger throws a very stylish party. Expensive shagreen (stingray skin) benches line the windows, and the sitting area features a sleek sectional sofa and floor lamp with oversize shade, à la Philippe Starck. A long white Parsons-style table, with twelve fabulously curvy black chairs, dominates the dining area. And the jewels! Often displayed in eye-level cases, the collections range from twisted modern (I.D. bracelets with goth lettering) to more traditional chandelier earrings dripping with precious gems ($1,000 to $3,000). Non-jewelry accessories like sterling-silver key chains ($95), corkscrews, and even candlesticks are surprisingly eye-catching, too. The bubbly handed out by the sales staff while you try on baubles only heightens the atmosphere—just don’t spill on the furniture.